Quitting is winning if you have identified the main purpose and it’s in the right timing to do so. 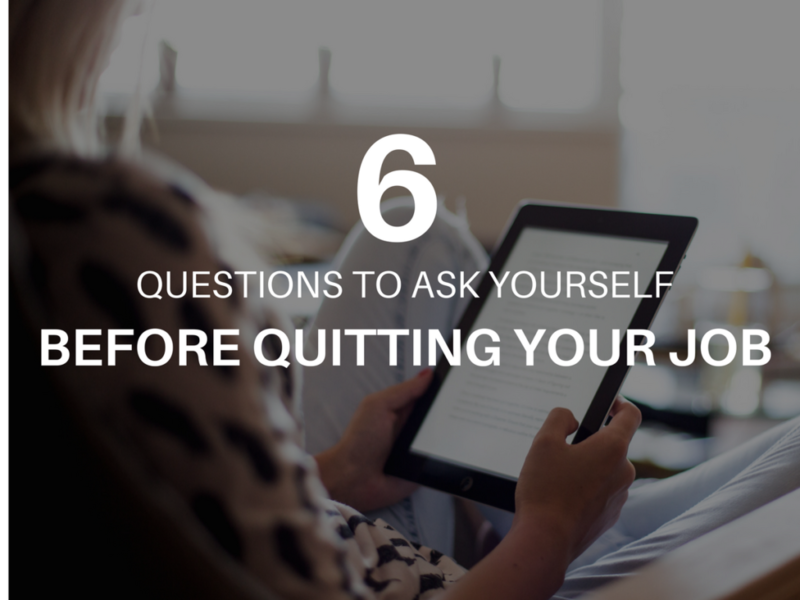 Here are six questions to ask yourself if you need to file a resignation letter and look for another job. 1. WHAT IS MY REASON FOR QUITTING? If you identify the “why”, it’s easy to determine the “what” and the “how”. Before diving into a final decision, be honest with yourself and ask, what is your main reason of quitting? Is it the toxic environment and people around you – the politics and negative people that adds too much stress? Is it the work itself that burdens you a lot (too many workload beyond your capabilities)? Are you stressed or disappointed because your expectations for this company haven’t been met? You’re not getting the right compensation and benefits not being paid – below industry compensation standards? Your “bad boss” whose only desire is to make you worse? Or you’re trying to just look for better career opportunities (i.e. from audit to private work or private work to consulting)? You’re not getting excited about your job and you think you’ll excel in the field that you really want (career change)? Think about this seriously. Don’t seek advice from your friends yet. Reflect. 2. IS THIS AN ISSUE I CAN STILL RESOLVE? See if your reason of quitting is something you can resolve. Talk to your boss or manager if you have any issues with communication, workload or even lack of training. Their job is to lead and manage you properly. Unless you speak up, nothing happens. You wouldn’t know but the boss of your boss or the other manager could come up with a solution or alternative to resolve your issue. If nothing happens still, answer the next question in this piece. If compensation and benefits issue is a concern that you were not aware of at the time you signed the contract, get some assistance from the HR team. If it doesn’t work, answer the next question below and take compensation as your top consideration the next time you get a job. If it’s about the office environment, see if you’re just the only person who has this problem – if it can be resolved by managing your emotions and changing your attitude towards the issue. If all else fails, answer the next question. If it’s only an emotion-based matter like stress and disappointments, check out my other album posts on how to deal with them. Maybe it’s not external but simply asking yourself what things will be left behind when you leave. Why did I get this job in the first place? Is it because of the career opportunity the company gives me? The experience and joy this work brings that I just felt one stress and decided to give up? Going back to the reason you picked the job might give you a reason to stay. 3. AM I FINANCIALLY PREPARED? Finances should be your top consideration when you leave your job, especially if you already have a family. Make sure to save at least 3 to 6 months (best is six months) to cover your expenses. This will give you cushion as you apply for your next job. You can look for another job while you’re in your current work (just do it creatively and secretly unless you want to experience its negative effect on your current state). Tell it only to your most-trusted colleague. If you’re quitting because you want to venture out into freelancing or business, make sure you save up more than just six months of emergency fund. Take calculated risks by estimating the costs to setup your new business. Though you can’t control what’s going to happen, having a buffer on this gives you a ground confidence not to lose all the hard-earned money at once. Remember that business takes time to get some initial profit and ROI. 4. DO PEOPLE WHO WILL BE AFFECTED BY MY DECISION KNOW ABOUT MY NEXT STEP? At the end of the day, your family or people whom will be affected by your decision should definitely know your next step not only because you need some support, but so they could prepare enough for the risk that you’ll take. Your family or parents should know this first. While you may encounter disagreements with them, it’s best that they know what’s going on. After all, who would be the one you could ask help from if you need so? 5. IS THIS THE RIGHT TIME TO TAKE RISKS? If you’ve talked to your family about your step, the next person to ask is yourself. Have you thought about the consequences of leaving employment and going into business right away? Do you have a network that can help with your decision? Maybe you need more time before going into business. Learn more about starting a business first. Feed yourself with knowledge. Prepare yourself emotionally, physically and mentally. If you don’t have a family to support yet, you can still take the risk to enter into business. After all, you can still go back to employment after. You wouldn’t know that you can succeed if you don’t try. Pray to God to give you the wisdom to decide what to do. 6. WHAT IS MY GOAL AND MY PLAN? You may simply not want your job anymore and you want to pursue the thing that you really want. Jumping into another industry where you don’t have any educational background is like jumping into a cliff. You don’t where you will land but you imagine that it’s something that can excite and give you fulfillment above other career opportunities. Practically, you can identify your current working skills that you can include in your resume to get the job in your “dream” industry. The larger the gap of skills that you need between your current industry and your “preferred career,” the more time you need to spend with in acquiring skills to suit yourself for that job. If your reason for quitting is something you have actually planned, like becoming a full-time freelancer so you can take care of your kids well, then do it. As long as you have decided it wisely and planned on what to do next, you can live with whatever happens. Planning is the key to prepare yourself for the worst. This way, you reduce the negative consequences your actions may result to.